Instead of trekking all over town to collect ingredients for a fruitcake that you’ll spend weeks dousing with whiskey, why not just give the whiskey? 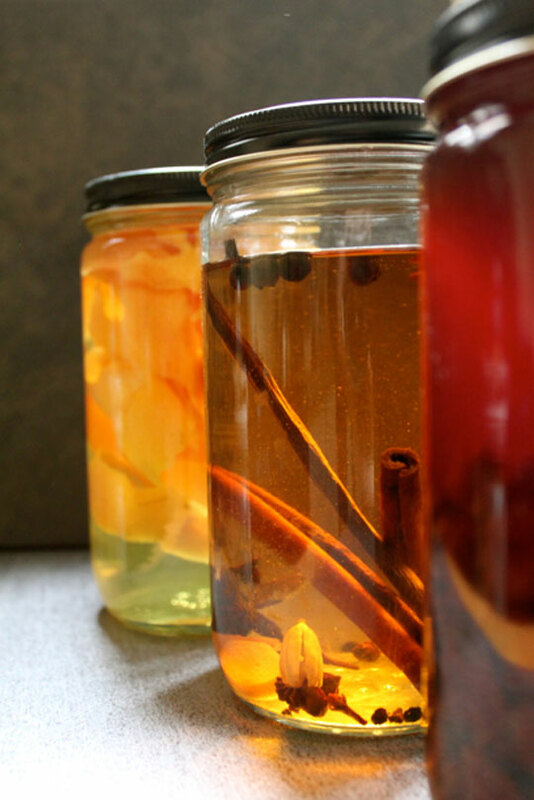 The gift of a bottle might not be anything new, but these wintry infusions give it a unique and personal touch. All will be welcome additions to the most creative mixologist’s arsenal, but they’re dynamic enough to be enjoyed on the rocks, with club soda, or mixed with warm cider for a hot toddy. Scour thrift stores for pretty bottles or jars, and finish them with handwritten tags. Wash citrus and use a vegetable peeler to remove the zest (the brightly colored exterior peel) of each fruit, leaving behind as much of the white pith as possible. Add the citrus zest to the bottle of vodka. Close and steep for 2-3 weeks. Combine in a large jar and seal. Shake jar daily to agitate spices. After a week, taste. When rum has reached your desired level of spice, strain and bottle. In a large jar, mix cherries, sugar and whiskey until sugar has dissolved. Close jar and steep for 3 weeks or longer. Find great bulk spices at area spice shops like The Spice Corner, 904 S. 9th St.; Penzeys Spices, 8528 Germantown Ave.; or your local food co-op.